The posh hotels of Waikiki, as seen from Diamond Head. 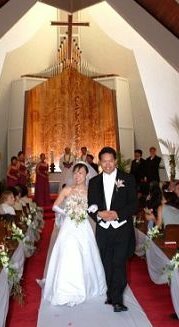 My friend Ronnin, a native of Hawaii who eventually wandered down to Austin, had his wedding in Hawaii, which presented an excellent opportunity to visit. We arrived on Wednesday at tropical Oahu, where we navigated to our hotel in Waikiki. I recommend taking H1, the freeway, because even though traffic is often kind of slow on H1, the Admiral Nimitz highway has a stoplight about every block and it took us an hour to get to the hotel. At this point we had a few hours to relax in the hotel and observe the steady flow of people in the streets below. Although Waikiki looks very high-rise and austere in pictures, at the ground level it has a tropical, laid-back feel. And while there are a number of posh stores, there are even more stores reminiscent of Hong Kong—little niches in the wall selling a variety of trinkets. It was hard to distinguish the first floor of the hotels from the stores, partly because the first floor was generally open to the air. For northern-born people like me, the concept of unenclosed buildings is hard to get used to, but has a pleasant, inviting aspect. In the evening we ate at Genki Sushi in one of the new malls; I wasn’t terribly impressed, although it was tasty. I was also disappointed that, despite the enviable proximity to the ocean, sushi did not seem to be as cheap as one might imagine in Hawaii. on the way to the top of Diamond Head. The next day we visited the Diamond Head Crater lookout. Diamond Head Crater is noticeably a crator, presumably from a volcano, although it does not look much like one. 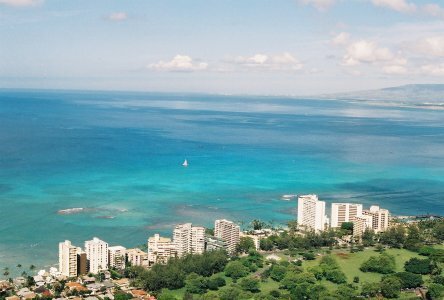 Diamond Head was a lookout base for the Army during World War II and you can walk up to the lookout pillboxes and get an unparalleled view to the south and east. The concrete constructions are rather quaint, and (probably for no particularly good reason) reminded me of the really old hospitals, particularly for mental patients. 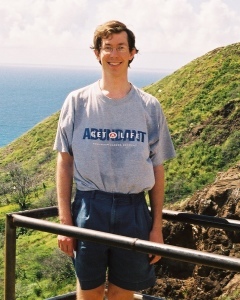 It takes maybe twenty minutes of easy walking to the top, where you can get the classic postcard picture of Honolulu. 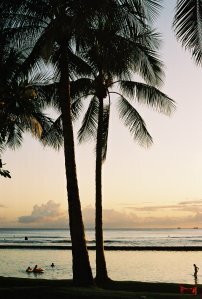 In the late afternoon we meandered down to Sans Souci beach (all except for Paul, who was sleeping and then never managed to find the beach) at the eastern end of Waikiki, where all the posh, semi-private-looking hotels were. Here Ronnin and his (then) fiancé, Amanda, had a welcoming dinner for any guests that happened to be in town a litle early. It was a pleasant picnic and I got to talk with a couple of Ronnin’s friends and meet his fiancé. • Became a state in 1959. • The big island, Hawaii, has the only active volcanoes. On Friday we swam with the fishes, I mean, snorkelled at Hanauma Bay. The travel books advised getting there early (7:30 am), although since this was Spring, it was less crowded than we expected. I would recommend arriving about 8:30, because it often rains in Hawaii, and the rain can be rather cold in the early morning. I was, in fact, ready to head back to the car after just one round in the water, but stayed just long enough that the sun came out and began to warm everything up. By about 10 am it was quite warm enough and I could not get enough of snorkelling around. The fish are not as brighly colored as they are in restaurants under the black lights, and they blend into the background more than you might expect, so photos look somewhat unimpressive. They are, however, unmistakably brilliant (one fish in particular being a rainbow of irridescent colors) and it is great fun to swim around fish who take no notice of you. There is one particular channel roughly in the middle that leads out to the ocean, and as you lazily cruise out, aided by the waves, the ocean floor begins to fall away and you pass above pillars of coral where schools of fish hanging out in the deep aquamarine waters. Sometimes there is nothing besides rather dull green-gray coral, sometimes there will be a nice collection of fish you’ve already seen many times, and sometimes you will see a fish you haven’t seen yet, all while you imagine cruising down ten feet lower, navigating the coral canyons with the fish instead of viewing them from above. Afterwards we visited the Pearl Harbor memorial. The memorial was one of three memories I have of my previous trip to Hawaii, en route to Japan, when I was maybe 5. Looking down at the water was not as scary as it was then... The memorial is, honestly, a little boring, but it is a peaceful spot that, along with the informational movie immediately prior to the ferry ride, enables one to imagine a little of what that day in 1941 was like. The ship still cries tears of oil, even sixty years later. Since we were near Chinatown, we stopped in for a bite of lunch at a restaurant there and were rewarded with an excellent meal. Afterwards we hustled to the hotel to change and make it to the wedding rehearsal and rehearsal dinner. The dinner was my first multi-course Chinese banquet and was, as all reports indicated, quite the lavish (and tasty affair). It was during this time that I discovered that the Japanese influence in Hawaii had influenced even the Chinese immigrants. Asia has a variety of gelatinous, glutinous desserts (which are much tastier than the adjectives suggest). One in particular, made of glutinous rice with sugar and poppy seed (or, in this case, peanut) filling, is called tāng-yuén in Chinese. This was served at the banquet (and was very tasty), where I observed Ronnin’s mother, who is probably about third generation Chinese, referring to them as mochi, a Japanese word for a particular kind of glutinous sweet-bean paste dessert. In fact, she did not seem to know about tāng-yuén, and I remembered that the brown tapioca balls in the Taiwanese bubble-tea we had in Chinatown earlier had been referred to as mochi, so it seems that all gelatinous Asian desserts are referred to as mochi in Hawaii. On Saturday morning Ronnin and Amanda were married, in a lovely wedding that I, and a number of others, spent much of photographing so that we could have a slide show of the wedding at the reception. The reception was quite nice and attended with plenty of excellent Hawaiian food. In the late afternoon, after becoming frustrated that no one wanted to do anything (why waste an afternoon in Hawaii in a hotel room? ), I took off on a walk along the Waikiki shore. I discovered that on Saturdays they show a movie on the beach, but kept walking, right out of Waikiki, in fact, into the neighborhood beyond. Some of the houses come right up to the edge of the concrete container, overlooking the water, with a walkway along the edge. Later on is a full-fledged beach, where people were night fishing and making out, which I passed as hastily as possible. The beach after that was a long beach with no exit, and when I finally found one I managed to walk some six miles or so from Waikiki, past a lighthouse that we had seen from Diamond Head. I returned to Waikiki by way of the highway and was treated to a magnificent view of the ocean. If you travel along the southeastern corner of Oahu, stop at the roadside park by the lighthouse. Upon returning to the hotel I had the opportunity for another walk along the main Waikiki beach with Paul, Chris, and one of the bridesmaids, who was quite fun and chatty. My feet were quite sore that night, and I slept the sleep of the exhausted!